A synergistic blend of herbs favored by women for the reproductive system. The perimenopausal period is the longest period in the life of a woman. A modern woman spends about 30 years of her life in the peri-and postmenopausal period. 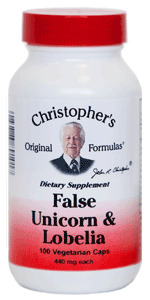 Dr. Christopher's False Unicorn & Lobelia aids the female body during hormonal changing periods & supports the female reproductive system.